An icebox cake gets its name from the fact that this is not a cake that is baked, but one that sets up in the refrigerator – a.k.a. the icebox, hence the name. The cakes are usually made with a mousse-like mixture that is stacked with layers of crisp cookies, like chocolate wafer cookies or graham crackers, and left to setup and meld together in the fridge. You can put together an icebox cake with any flavors, but this Chocolate Ricotta Icebox Cake is a great basic recipe because it is chocolate (which just about everybody loves) and so easy to make! The cake reminds me a bit of a ricotta cheesecake, as it has a hint of ricotta texture to it and is lighter than a cheesecake made with cream cheese would be. It is not very sweet, however, and you can really taste the dark chocolate. 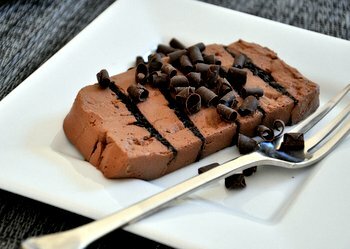 For this reason, I definitely recommend using a dark chocolate that you like the flavor of – and choose one this is not too dark or bitter, or your icebox cake might be a little too bitter from the chocolate. I definitely recommend using dark chocolate that is no more than 65% cacao or so in this, rather than something darker. And also know that you can even get away with using semisweet chocolate chips in a batch and still get a nice, chocolatey result. To assemble the cake, you spread chocolate wafer cookies with the ricotta and chocolate mixture and stack them together, then lay the stacks into a loaf pan and surround them with more of the ricotta mixture. This is one of the easiest ways to put the cake together, and allows for a fast assembly. Serve the cake with chocolate shavings and whipped cream to lighten it up and highlight the chocolate even more. This cake needs to be refrigerated, so plan to make it well in advance of when you want to serve it. It should chill at least overnight (12 hours) for the best results, and it will keep in the refrigerator for up to 2 or 3 days. IF you want to keep it longer, try freezing the cake and defrosting it in the fridge a few hours before you want to serve it. In a food processor, combine room temperature ricotta, melted chocolate, vanilla and honey. Whizz until mixture is very smooth, the scrape the sides and pulse several more times until everything is very well combined. Line a 9×5-inch loaf pan with parchment paper and lightly grease. Spread a 1-inch layer of ricotta mixture into the bottom of the pan. Spreading the ricotta mixture between cookies, make three stacks of 5 cookies each. Try to evenly space the cookies and put at least 1/4-inch of filling between cookies. Turn each stack sideways and arrange them horizontally in the pan. Press down firmly until the cookies almost reach the base of the pan. Fill in the gaps around the sides of the cookies with more ricotta mixture and spread any remaining ricotta on top. Cover with plastic wrap and chill for at least 12 hours, or overnight. To serve, turn cake of of the pan and remove the parchment. Cut in thin slices with a sharp, warm knife and serve with whipped cream and chocolate shavings. Wow, that looks delicious! It seems like the only place I can find the chocolate wafer cookies is Big Lots, and they don’t always have them. Someday, I’ll just make them. Jennifer, My grocery store keeps them in the baking section; not with the cookies as you might think. I’ve also seen the chocolate wafer cookies on an end cap of the ice cream aisle. Thanks! I’ll have to look there; I hadn’t thought of that, but it makes sense, as they are often used as an ingredient, rather than being eaten on their own. Trust me when I say that it all becomes much clearer when you have the cookies and the pan out, because they really only fit in there easily one way! Good luck!